Root Cause Analysis (RCA) is a process that uses several problem solving methods to identify the origin of a problem. The analysis answers when, how, and why a problem occurred in the first place and implements an effective solution to ensure the problem doesn’t happen again. Sometimes, the RCA process highlights other areas of improvement in the organization and provides an opportunity to eliminate future problems. There is not one single way to perform root cause analysis successfully. Instead, it encourages creative and critical thinking to discover all possible causes that led to the original problem. Many problem solving tools and strategies can be used in the process. Below is an introduction to the RCA process. The first step is to clearly define the problem. This includes identifying what is happening as well as identifying the “side effects” of the problem. Side effects can be caused by by one or more underlying problems and thus, should be treated with equal importance until more information is gathered. Once more information is collected, side effects can be prioritized in order of urgency. Collecting and interpreting large amounts of data can be a daunting task and is typically the longest step in the RCA process. Therefore, it’s beneficial to break up data collection into stages. Information should be immediately gathered on where the problem is occurring, how long the problem has been occurring, and the impact the problem has on external factors. The latter determines the significance of the problem. Examples of external factors include personnel safety, environmental safety, equipment, and revenue. The next stage of data collection provides information for analyzing causal relationships. This involves full data acquisition of the history of the equipment or system under investigation, the team members involved, and the organizational strategies employed. Once the investigators are satisfied with the quantitative and qualitative data gathered, all possible causal factors are considered. The three major types of causes are equipment trouble or failure, human error, and/or flaws in organizational strategy. However, it’s not enough to stop investigation with the most obvious causal factor. Problems are usually caused by one or more of these factors, or lack thereof, and may contribute to the root problem. The simplest way to organize data and make connections to causal relationships is to create a visual map. Maps clearly identify the root cause(s) and sequence of events that lead to the problem. Additionally, maps may target opportunities for downstream areas of improvement. For example, if the problem defined in Step 1 dealt with the hydrotreating process unit, analysts may determine ways to eliminate problems downstream in the isomerization or alkylation units. During the final stage of the RCA process, root causes are identified and analysts begin to develop strategic solutions. An effective RCA solution is one that involves all stakeholders and has a positive impact on the reliability of equipment, operational costs, the environment, and even corporate reputation. Furthermore, an effective solution is one that realigns causal factors to the new strategy. Consider an example of a piece of equipment that needs to be decommissioned due to unrepairable corrosion damage. The root cause was determined to be that inspection intervals were not appropriate for the age of the component. The solution may be to replace the equipment and implement a strategy that reconsiders inspection intervals at various stages of an equipment’s lifecycle. Furthermore, engineers, operators, inspectors, maintenance, and management personnel need to be briefed and trained on the new routine inspections strategy. Solutions are unique to every organization. One widely known strategy that has been integrated into many organizational strategies is Kaizen. Kaizen is more of a philosophy than a strategy, but nevertheless facilitates company-wide participation in continuous improvement. This means that an accumulation of small actions improve workplace activities. If everyone in the workplace participates, the company will experience growth in production and will be able to prevent failures from occurring in the future. Below are two common RCA tools used to identify causal relationships (Step 3 Above). However, there are a number of approaches to successfully determine root causes not mentioned here. Other failure analysis tools include the failure mode and effects analysis (FMEA), impact analysis, and risk analysis. Problem: Refinery “X” had to shut down plant operations. Why? Toxic fluid leaked into the plant from a pipe. Why? Corrosion under insulation created a hole in the pipe. Why? It had gone untreated for a significant amount of time. Why? Operators didn’t know about the damage. Why? Operator/inspection personnel didn’t perform routine inspections. From this example, one can see that there are several areas of opportunity for improvement. If “why” was only asked twice, the solution would focus on corrosion under insulation. However, further questioning reveals that the true cause was lack of routine inspections. The 5 Whys approach is a powerful tool that should be done asking multiple questions to identify multiple root causes. A Cause and Effect Diagram, also known as a Fishbone Diagram, is a tool that is commonly used to visualize processes. Sometimes the oil and gas industry refers to these diagrams as C&E Diagrams. The diagram is constructed from a single horizontal line (the “backbone”) that represents the problem. The angled lines intersecting the backbone of the Fishbone Diagram organize several cause-and-effect scenarios. Causes can be generically broken down into six categories: environment, methods, machines, material, people, and measurement. Possible effects are listed under each cause. Below is a simplified example of how a fishbone diagram would be constructed. In reality, these diagrams can be much more complex and include more than the six categories previously mentioned. In the example, a refinery is analyzing what the root cause is for hydrogen induced cracking in a low-temperature pressure vessel. Based on the 5 Whys analysis and the fishbone diagram, one can see that one major root cause was unplanned routine inspections. 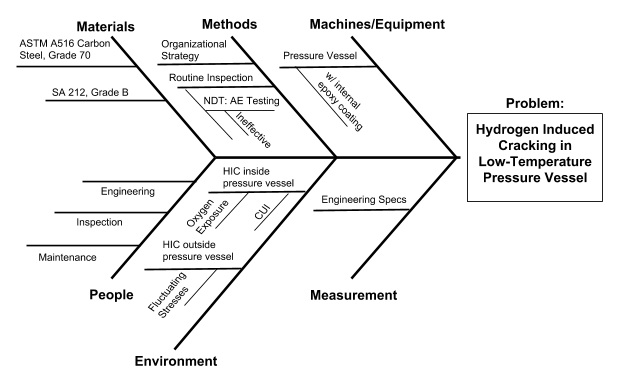 The fishbone diagram also illustrates that the nondestructive testing (NDT) method used was ineffective. Further investigation determined that advanced ultrasonic testing methods (e.g., phase array ultrasonic testing or time of flight diffraction) would be more reliable methods for detecting and characterizing corrosion. Thus, the solution to the corrosion problem would be develop routine inspection intervals for the pressure vessel and provide training to personnel to set-up and operate advanced NDT methods. Offshore platforms pipelines, terminals and downstream facilities, are costly to build, operate and maintain, so it’s imperative that operators keep tight control over the total life-cycle cost of all associated equipment. This case study provides a chronological review of several thermal anomalies discovered within a customer's storage tank that was being used to house soy beans. The first signs of a problem within the storage tank were found when thermal imaging of the north side of the tank revealed an uncharacteristic hot spot. It is another day at the plant and as usual, your boss calls and says there is a meeting in the conference room that he wants you to attend regarding a compressor failure. That is all you know, but from experience you know it must be something major since all the &ldquo;brass&rdquo; will be in the conference room.